Higgins is special because he is such a sweet boy. Every morning, he jumps around his cage shaking his head because he is so excited about getting his greens. When it comes to food, he always gets excited. When I get home from work, he is always glad to see me & climbs up the side of his cage. When I open his cage door, he comes to the front waiting to be petted. But one of his favorite things is being kissed right on his nose. 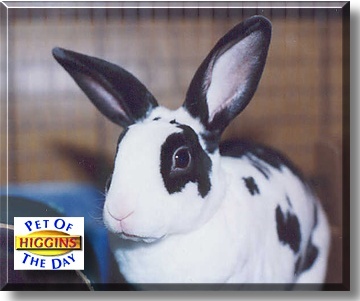 He is a very outgoing, friendly bunny, especially with his Mom and his Mom loves him very much! And besides that, he is very photogenic!